NEW YORK Audiences might be forgiven to believe "Hyde Park on Hudson" represents the stirrings of a new art house tent pole franchise - the stuttering monarch of "The King's Speech" returns, this time paired with a U.S. president with polio. Oh, the toy merchandising! Snark disabled. But the thought was prompted by the notion that the character of George VI - previously portrayed in an Academy Award-winning performance by Colin Firth, and here by Samuel West ("Howards End") - is a remarkable jumble of self-doubts and determination, making him a very human figure fitting into a role meant to represent something slightly more. With forebodings of war against Nazi Germany in the near distance, the King takes the first trip to America ever by a British monarch in order to curry an alliance with the isolationist United States. The mission not only represents possibly the only chance of survival for his nation, but also a proving ground for his own position as King - a role he never wanted, and which was ceded to him following Edward VIII's abdication to marry (gasp!) an American. The trip also brings him face-to-face with a father figure, U.S. President Franklin Delano Roosevelt (Bill Murray), who - patrician upbringing notwithstanding - has fine-tuned his ability to relate to the public in ways unfathomable to the monarch. FDR also knows what the royals hope to gain, and in exchanges that carry the deftness and undertow of a bridge game, Roosevelt and the Americans engage in a sort of gamesmanship with the Brits where the actual prize - a war alliance - is barely spoken aloud. "Hyde Park on Hudson," inspired by the real events of June 1939's "hot dog picnic," is based on the diaries and letters of Daisy Suckley, a fifth cousin of Roosevelt who became the president's confidant and mistress. After Daisy died at age 100, her correspondence was found, opening a new window into the private life of FDR (whose relationships with first lady Eleanor and his secretary Missy LeHand were already well-documented). Daisy (played by Laura Linney, of "You Can Count on Me" and "The Savages") is invited to the Roosevelt family home in Hyde Park, N.Y., as a distraction to FDR, but their friendship soon passes into something more physical. This was, of course, an era when staff, the press, family and even other mistresses tended to turn a blind eye to such indiscretions. Directed by Roger Michell ("Notting Hill"), "Hyde Park on Hudson" is a light, nostalgic look at what turned out to be an incredibly important turn in history. It is also as mercurial as history, as when one of the sweetest scenes in recent films - FDR and Daisy's drive through flower-filled fields - becomes something else entirely. 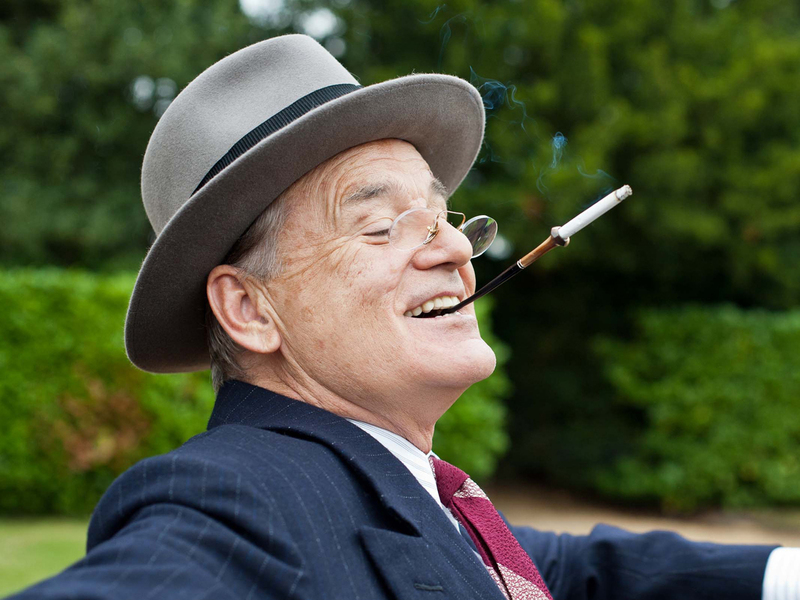 Yes, this movie is rated R.
The whirlwind of the film circles FDR, which is dramatically expected - and unavoidable, given that FDR is played by Bill Murray. His sardonic good humor is fitting for the larger-than-life figure (whom Murray has referred to as "that guy on the dime"), but it is impossible to forget he is Murray, so strong is the actor's blithe, winking air. The deft cast also includes Olivia Williams as Eleanor Roosevelt, Elizabeth Marvel as Missy, Olivia Colman as Elizabeth, and - as stand-ins for Upstate New York - the Chiltern Hills of England. The film's evocative photography, costumes and pitch-perfect production design add luster. "Hyde Park on Hudson" opens in theaters December 7 (Pearl Harbor Day!) from Focus Features. Screenplay by Richard Nelson; produced by Michell, Kevin Loader and David Aukin.